In a territory rich in cities of art, nature, spas and many other things, there are many things to do, to see, and to help you I have thought perhaps if might be useful if I give you some guidelines on how to organize your days, indicating some routes more and less demanding. Advice where to eat, the cellars that we can suggest you visit and other things we will tell you on your arrival. Leaving from Montorio travelling the beautiful road that takes you towards Montalcino we suggest that you stop at Pienza. Characteristic with its houses with balconies of flowers, the main street with many shops where it is possible to taste the famous Pecorino of Pienza. Not to be missed is the Piccolomini Palace, the Cathedral and the splendid view over the Val d'Orcia and if you have time the Corsignano Parish Church. 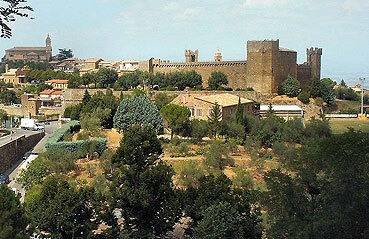 Continue on to San Quirico d'Orcia, which merits a short stop. The beautiful "Orti Leonini" gardens and the careful restructuring of this small town. 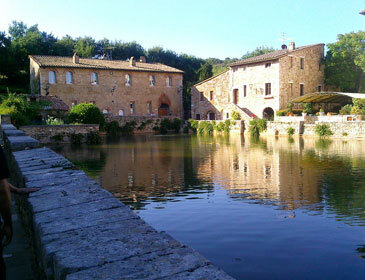 We suggest that you pass by Bagno Vignoni, unique of its kind. Famous for its thermal waters, its characteristic that marks it, is the central pool with thermal waters and around which the town developed. Continuing on to Castiglione d'Orcia from where you can enjoy a beautiful view from the fortress, then continue on towards Castel Nuovo dell'Abate where you find the beautiful church of Sant'Antimo and where at certain times of the day it is possible to hear a Gregorian chant. At this point for the lovers of wine we suggest a visit to one or two of the cellars that are found in the area or a good lunch in a ' trattoria - restaurant'. Continuing on to Montalcino, a brief visit of the town, a stop in the ' enoteca – wine shop' in the Fortress for a tasting or carry on with a visit to the cellars. And then returning the 45km to Montorio exhausted, but happy, to enjoy a sunset with a good glass of red wine. 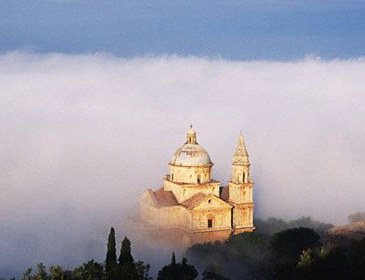 I suggest a visit of Montepulciano in the morning, going on foot and passing theTempio di San Biagio, work of Antonio da Sangallo the Elder, then reaching the summit of the hill on which Montepulciano lays. The town is beautiful, rich in Renaissance places, the Cathedral, the suggestive Piazza Grande – Main Square, today often used as the location of well-known films, Palazzo Ricci, the view over the Val d'Orcia and over the Val di Chiana, where on clear days you can see Lake Trasimeno. Montepulciano is among other things famous for vino Nobile and I suggest a visit to the cellars and have a tasting of Vino Nobile. 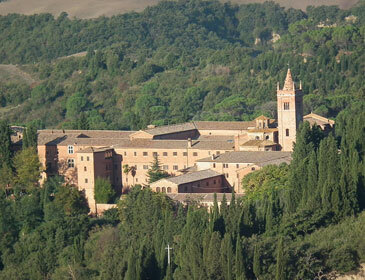 On request we can organize for you a guided visit of Montepulciano that will last about three hours. A lovely lunch in one of the many characteristic trattorias and then you can slowly walk back to Montorio. On Wednesday afternoon and Saturday morning the Garden of La Foce is open to the public, a private Italian garden, well looked after, elegant and neat that will take you back to the taste of former days. From here you can go to Monticchiello, a small fascinating hamlet, and still not too frequented by the tourists, then to finish with an excellent dinner. This is a part little visited and known by tourists, but appreciated by artists, painters and photographers for its particular beauty. You go towards the natural park of the Val d'Orcia, today declared a UNESCO heritage and arrive at Castelmuzio, Montisi, Sangiovanni d'Asso (famous for the white truffles). Continuing on to the Abbey of Monte Oliveto Maggiore where you can stop and visit the famous frescoes by Signorelli and Sodoma and listen to the Gregorian chant. A small deviation for the more sporty is walk along a beautiful white road, where cars rarely pass, that will take you to a very small hamlet. Follow these roads to savour the perfumes, colours and sounds of Tuscany, that will certainly remain in your heart. To go to Siena by car takes about and hour but you will need to watch for all the signs where to park, so as not to waste time. 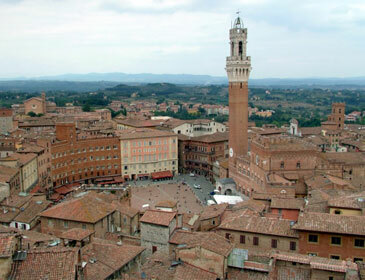 What can I say about Siena, it is the city of the Palio, a city that I love deeply and where I lived for years and that I know very well, and for which I will give you some useful advice for shopping, restaurants, museums and many other things. It is the biggest city in southern Tuscany and for this there are many tourists, but how can't you stop in this beautiful city if you are in these parts, have a coffee in the Campo Square perhaps under the warm sun whose heats is not the same. San Gimignano rom Siena is about circa 40 minutes by car. But if you have time and your aren't tired I suggest that you stop at Monteriggioni, it is like you have entered into the past: a big wall surrounds it and in the town there is an excellent restaurant. San Gimignano famous for its towers is a characteristic town of Chianti (called Chiantishire), visit the Cathedral, the Collegiate church, the museums. To return to Montorio, will take about an hour and a half. 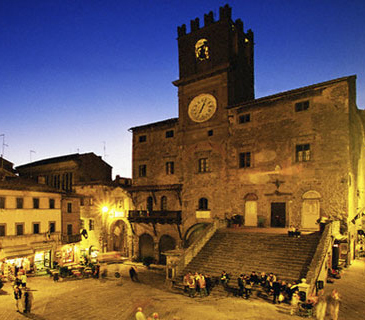 Cortona is found on the opposite side of the Valdichiana and is on a lovely hill that is always kissed by the sun. You need about 40 minutes by car, and half way along the journey I suggest a stop with a guided visit to the prestigious Avignonesi cellar, where on request, it is possible to also stop for lunch. Then visit the Cortona information office, it will fascinate you with its warmth and you need to drive only 30 km to arrive at Arezzo where you can visit the historical centre and visit the works of Piero delle Francesca. Montepulciano is found in Tuscany, but is only 25km from the border with Umbria and the tour that I suggest is long, but the roads for the major part are highways and so the destinations can be easily reached. You can make a tour to the first destination Perugia, (around 100km – an hour and 10 minutes) the city of Perugina Chocolate and in the month of October an entire week is dedicated to chocolate. 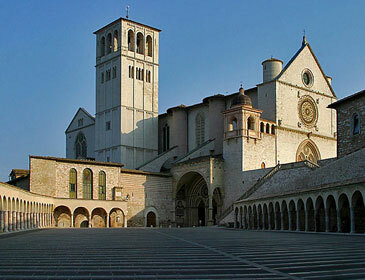 Also famous for Umbria jazz in its historical centre, in the month of July. - Florence: you can reach it by car or you can go in comfort by train, and I can book for you the Uffizi and the Galleria. If you are lovers of shopping I suggest you stop at The Mall and a Space . - If you are sporty , in this case there is no shortage of choice. There are many paths where you can visit on foot beautiful centres. If you want to go by bike, well in that case we can work with an expert tour operator who will supply you with a bike suitable for you needs, itineraries, and if you want also a guide. - If you're looking for a more relaxing holiday we can also satisfy you. This is a thermal area with water that gushes from under the ground at 50° and I can suggest to you the spas that are best suited to your requests.